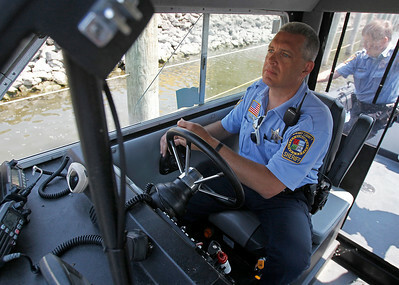 Matthew Apgar - mapgar@shawmedia.com McHenry County Sheriffs Office Marine Unit Deputy Bill Wacaser navigates the Fox River through the Stratton Bolger Lock and Dam on Tuesday, June 9, 2015 in McHenry. 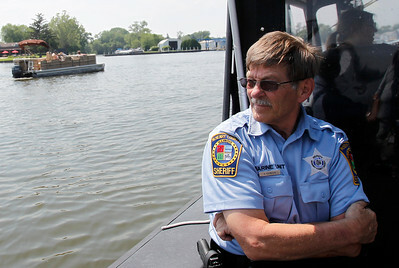 Matthew Apgar - mapgar@shawmedia.com McHenry County Sheriffs Office Marine Unit Deputy Gary Counihan looks out on boaters during patrol of the Fox River and Chain O'Lakes on Tuesday, June 9, 2015 in McHenry County. 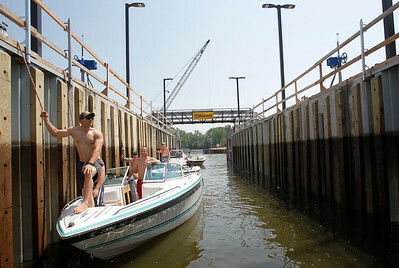 Matthew Apgar - mapgar@shawmedia.com Allen Davis of Wheaton, front, holds onto a rope to steady the boat he and (front to back:) Neil Davis, also of Wheaton, Mike Rutkowski of Fox River Grove, and Jared Gudaitis of Lisle operate at the Stratton Bolger Lock and Dam on Tuesday, June 9, 2015 in McHenry. 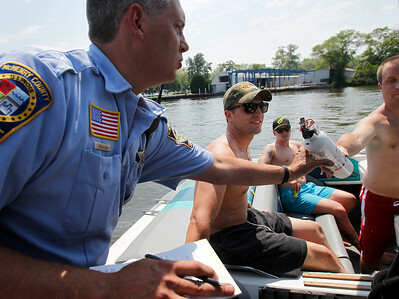 Matthew Apgar - mapgar@shawmedia.com McHenry County Sheriffs Office Marine Unit Deputy Bill Wacaser, left, performs a routine boating safety information check with Allen Davis of Wheaton, Jared Gudaitis of Lisle, and Mike Rutkowski of Fox River Grove on Tuesday, June 9, 2015 in McHenry. 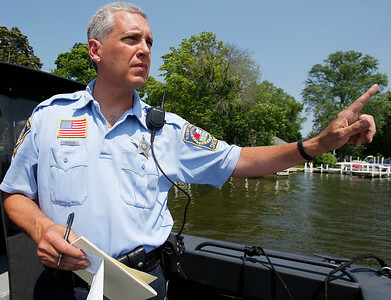 Matthew Apgar - mapgar@shawmedia.com McHenry County Sheriffs Office Marine Unit Deputy Bill Wacaser motions for a boater ignoring the "no wake" warning signs on the Fox River to stop so that he can issue a warning to its operator on Tuesday, June 9, 2015 in McHenry County. Matthew Apgar - mapgar@shawmedia.com McHenry County Sheriffs Office Marine Unit Deputy Bill Wacaser, left, performs a routine boating safety information check with Allen Davis of Wheaton and Jared Gudaitis of Lisle on Tuesday, June 9, 2015 in McHenry. 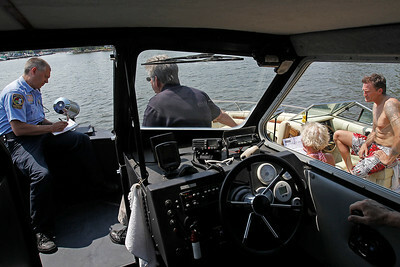 Matthew Apgar - mapgar@shawmedia.com McHenry County Sheriffs Office Marine Unit Deputy Bill Wacaser, left, issues a warning for boaters ignoring the "no wake" warning signs on the Fox River on Tuesday, June 9, 2015 in McHenry County. 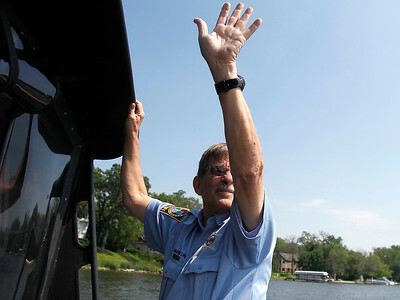 Matthew Apgar - mapgar@shawmedia.com McHenry County Sheriffs Office Marine Unit Deputy Gary Counihan waves to boaters during patrol of the Fox River and Chain O'Lakes on Tuesday, June 9, 2015 in McHenry County. "A large part of our jobs is waving," Counihan said with a laugh. McHenry County Sheriffs Office Marine Unit Deputy Bill Wacaser, left, performs a routine boating safety information check with Allen Davis of Wheaton, Jared Gudaitis of Lisle, and Mike Rutkowski of Fox River Grove on Tuesday, June 9, 2015 in McHenry.